How To Bake Seven Easy Yummy Christmas Cookies. Unbaked Ritz Cracker Cookies. 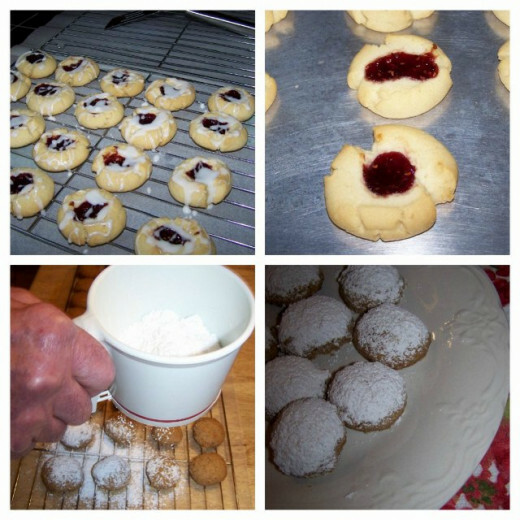 Yummy Delicious Easy Christmas Cookies, seven in all. 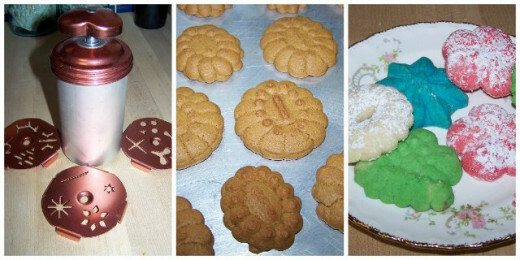 We have always made lots of cookies for the holidays. 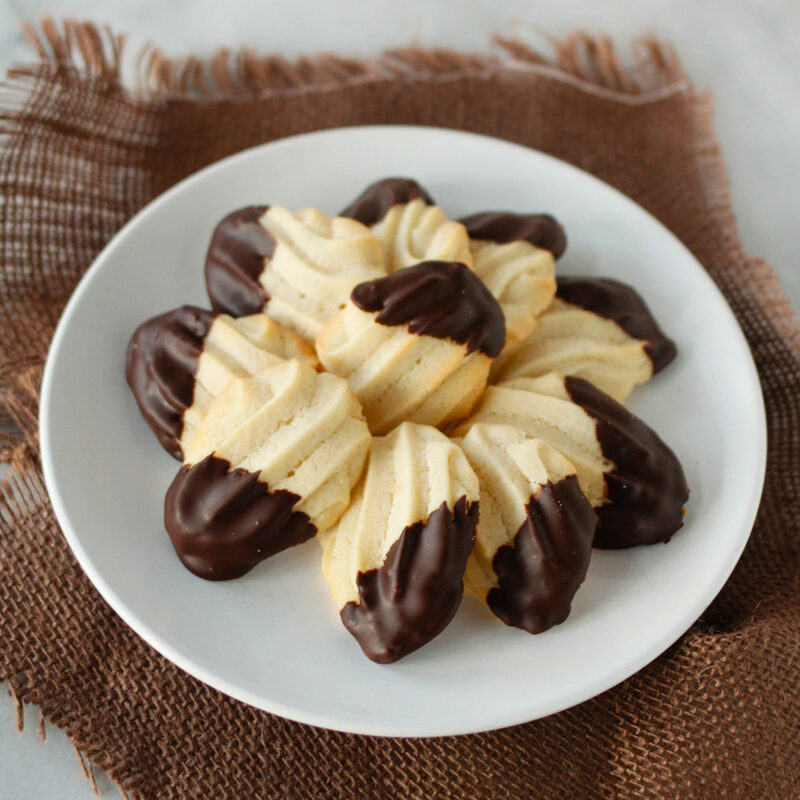 The Ritz Cracker Cookie has always been a favorite. Our son looks forward to them every year. I make the cookies with milk and white chocolate. I melt each separately in a double boiler on top of the stove. I add a little wax to the chocolates because it helps keep the chocolate together and it clings better to the cookies. I decorate with frosting from the can or make my own. You can also buy the frosting in a can or tube with their own tips if you use that product you don't need the food coloring. Melt chocolate in a double boiler adds one piece of wax. Dip Ritz Crackers filled with peanut butter in chocolate. Place on wax paper. I add holly decoration on top. You can make your own frosting or buy frosting to do this. I freeze the cookies before I decorate with a holly design. Different Melting Instructions For Chocolate. Microwave Method: Pace one inch cubes in microwave safe bowl. Microwave as follows, stirring at each interval: Dark Coatings: medium level in 30 second periods. White and Milk Chocolate Coatings: Defrost level in 30 second periods, Melt to 110°F. Stove Top Method: Place one-inch pieces in a double boiler over hot, not boiling water. Stir often and remove from heat when melted. Melt to 110°F. Personally I like stove top method I have ruined chocolate doing it in the microwave, but many people like the microwave method. Peanut Butter Blossom Cookies and Russian Teacakes. Cream sugar, butter, peanut butter together. Beat in eggs, milk, and vanilla. Add all dry ingredients. Shape into balls and roll in granulated sugar. Bake 10-12 minutes in 375°F. Remove from oven press a chocolate kiss in each one. Christmas Tree With Hershey's Candy Kisses. Place a Christmas tree on top your Blossom Cookie with the star tip from a can of Betty Crocker Cupcake Icing or with your own homemade icing using the star tip. 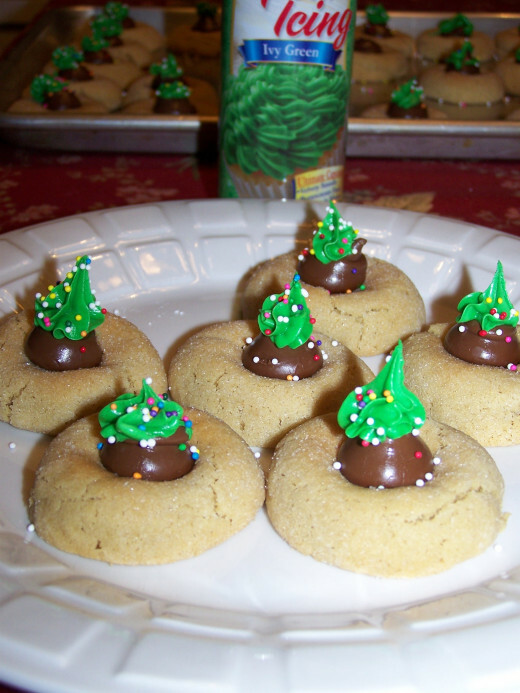 On these cookies I used Hershey's Candy Kisses, they make better trees. Mix butter, sugar, and vanilla thoroughly. Measure flour by dipping method or shifting. Stir flour and salt together; blend in. Mix in nuts. Chill dough. Heat oven to 400°. 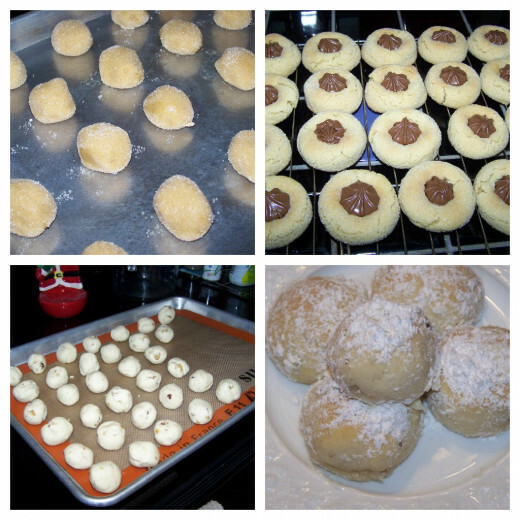 Roll dough in 1" balls. Place on ungreased baking sheet. ( Cookies do not spread.) Bake 10-12 minutes or until set but not brown. While still warm roll in confectioners' sugar. Cool. Roll in sugar again Makes about 4 dozen. Raspberry Almond Shortbread Thumbprints Cookies and Pecan Puffs. Heat oven to 350. In large mixer bowl, combine sugar, butter and almond extract. Beat at medium speed, until creamy. Reduce speed to low; add flour. Beat until well mixed. Shape dough into 1-inch balls. Place 2 inches apart on cookie sheets. With thumb, make an indentation in center of each cookie (edges may crack slightly). Fill each indentation with about 1/4 tsp jam. Bake for 14 to 18 minutes or until edges are lightly browned. Let stand 1 minute; remove from cookie sheet. Cool, 10 minutes. Meanwhile, in small bowl stir together powdered sugar, 1 1/2 tsp almond extract and enough water to make a thin glaze. Drizzle over cookies. Cool completely. 3 1/2 dozen cookies. Cream butter until soft. Blend in sugar until creamy. Add vanilla, stir in flour and vanilla; add pecans. Roll dough into tablespoon balls. Place on a greased cookie sheet. Bake at 300 degrees for 35-40 minutes. 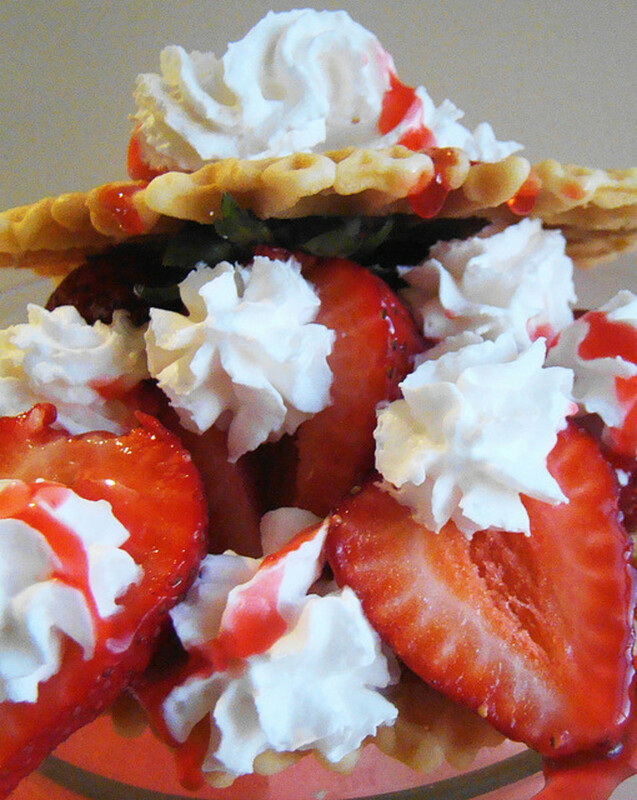 Remove from oven and sprinkle over the top with confectioners' sugar, then again when cool. Yield: 28 puffs. Cookie Press Ginger Snaps And Spritz. I decided to make Spritz and Cooky Press Ginger Snaps. I found out my nice electric cooky press didn't work. I had to take out one of my old stand by vintage cookie presses I used when the kids were growing up. We made seven different cookies. I'm hoping to give some as gifts and the rest are for Christmas. Preheat the oven to 375°. . Cream the butter and sugar until fluffy, then add the molasses and the egg. Combine dry ingredients add slowly to softened butter mixture. Mix dough until fluffy, dough should not be crumbly. Fill the cookie press with dough. Place on ungreased cookie sheet. Bake for 9-10 minutes. Cooky Press Ginger Snaps on the left and Spritz on the right. Heat oven to 400° Mix butter, sugar, egg, salt, and flavoring thoroughly. Measure flour by dipping method or by shifting. Work in flour, Using 1/4 dough at a time, force dough through the cooky press on ungreased baking sheet in desired shapes. Bake 6-9 minutes, or until set but not brown. Makes about 5 dozen. Chantelle Porter, Thanks so much for stopping by and have a Merry Christmas and Happy New Year. I love the Ritz cookie idea. Delicious and cute! rebeccamealey, The thumbprint cookies would make pretty Valentine cookies. Thanks so much for stopping by. Shyron E Shenko, Thank for stopping by. I know too much sugar can ruin a diet. He's holding his own not too sick from chemo or radiation. Thanks so much for asking. Sorry it has taken me so long to back with an answer. 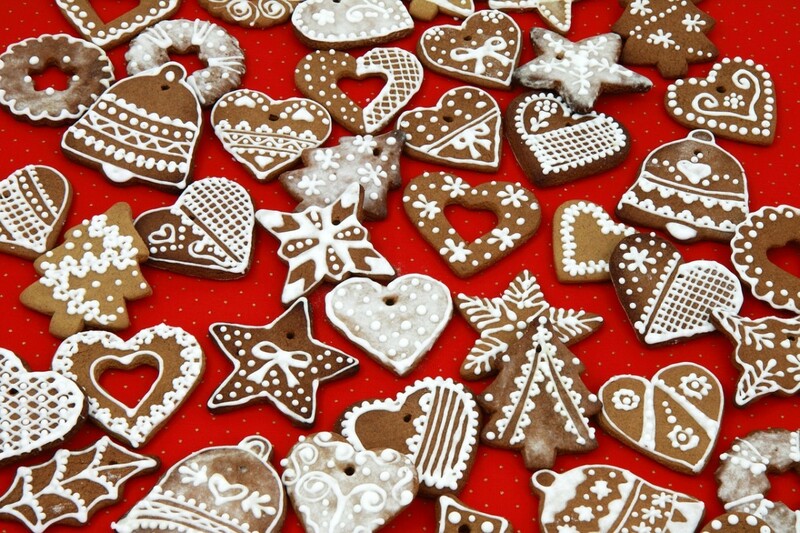 A beautiful collection of cookies. It makes me ready for Christmas again. Maybe I will make the thumbprint ones for Valentines. Thanks! Awesome, I gained weight just looking at these cookies. I love them all, but try not to do to much sugar. Voted up, ++ and shared. pstraubie48, Me to just salads after Christmas. Our house if felling up with goodies and their not ones I baked, seems everyone is dropping off something. Thanks so much for stopping by and Merry Christmas. 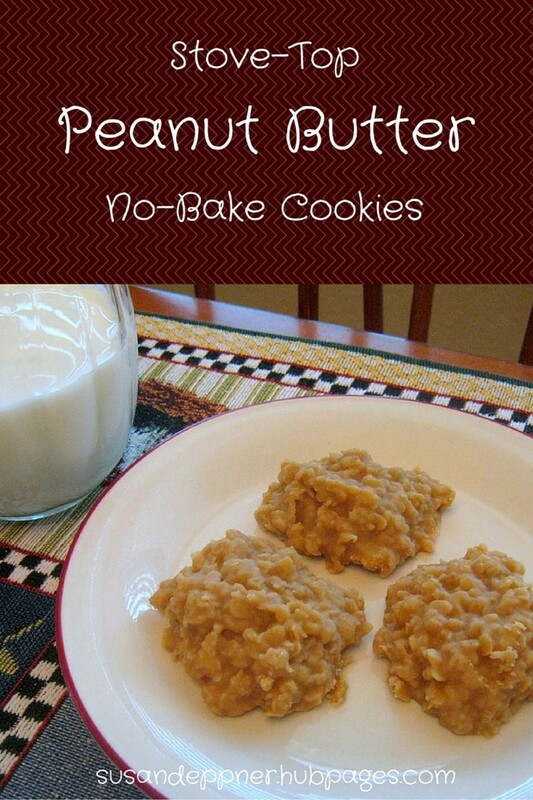 Good morning I bookmarked this page before I even read it....The peanut butter blossoms are a favorite ...yum. I am anxious to try your others especially the Russian tea cake. Also the Ritz dipped in chocolate I just recently tried, yum. Did you know that they have a Ritz that is garlic flavored? It is a great appetizer with or without cheese or peanut butter or dip. Thanks for sharing..I will need to walk ten miles a day instead of four after all of the yummies!!! Au fait, Thank you and thanks for coming by. I appreciate the sharing and pin. Just 1 week until Christmas! 'Tis the season for cookies and more cookies. Have pinned this to my 'Christmas II' board, and will share it again with followers who may be looking for some new cookie recipes for this year. Your photo makes them look very festive, and I know they're delicious! thelyricwriter, Thank you for stopping by and thanks for the vote, facebook share and stars I appreciate it. Moonlake, these look awesome! I love cookies, it's no secret:) Perfect hub with everything that you need, bookmarked this one:) Up, useful, awesome, interesting, shared on FB, and 5 stars. Great on everything my friend. I will certainly try these next weekend. Peggy W, Thank you I appreciate that. Will share this once again so that cookie lovers out there can try more of your recipes. Chris Achilleos, Thank you and thanks so much for stopping by. I appreciate the vote. Great hub moonlake! These cookies look so divine. Thanks for sharing the delicious recipes, I will certainly be looking forward to trying them. Voted up, awesome and useful! Peggy W, Thank you I'm always glad to get a pin. Deborah-Diane. Like I said to beingwell you will love this recipe. They are good and what could be easier. Thanks for stopping and for the comment. beingwell, Pleae, please send us some of that heat. You will love this recipe. Wow! I love the idea of thee dipped cookies. I will have to give them a try. Yummy! Ooohhh wow! I love that dipped cookie recipe, moonlake. That will go great with my iced coffee. (It's really hot right now in Thailand.) haha! Barbara Kay, Thanks so much for stopping by. Our son does too his favorite. My Granddaughter made these for me. MMM, they are good. I love them. Peggy W, A cookie press is lots of fun to use. I think I have about 3 different ones that I have collected through the years. Came back and read again. Gave your cookies another 5 stars. May have to add some of your recipes to my usual ones that I do every Christmas to give away as gifts. Your plate with the assortment is so pretty. I don't have a cookie press. They certainly do make pretty designs! acaetnna, Thanks for stopping by. They are all so good. Mmmm - yummy , scrummy ideas - thank you. frogyfish, No problem go ahead and link I will check out your cookie hub. Thanks so much for coming by and leaving a comment I appreciate it. Moonlake, what a delightful array of cookies. Thank you so much for your recipes, pictures, tips...I love the thought of those Ritz PB cookies...sounds easy as the plain cracker ones, but so much more....um..yum with the PB. I will have to remember your recipe for next Christmas baking...didn't do any this past year. I love decorating the cookies, especially with edible glitter on Christmas frostings. If you don't mind I would like to link your page to my cookie hub. Very enjoyable reading...and no calories here! Wonderful, and thank you! shiningirisheyes, Your welcome thanks for stopping by. I appreciate it. KoffeeKlatch Gals, Thanks so much for stopping by and thanks for the vote and sharing. mmmmh mmmmmh good. Thanks for the recipe share. moonlake, what a wonderful idea, dipping Ritz crackers in chocolate. I would have never thought of it. You have a terrific selection of cookie recipes. And your pictures are great. Thanks for sharing. Up, awesom, useful, interesting, and definately sharing. faythef, The ritz cracker ones I had to mail to my granddaugher yesterday. I forgot them at Christmas and she was so upset, they are her favorites. Thanks so much for stopping by. Au fait, Thank you and thanks for stopping by and leaving a vote, share and a star. I appreciate it. They are all good cookies and so easy. A great hub just full to overflowing with great cookie recipes! I've made some of the cookies you feature here and they are delicious and so easy you really have to try to mess them up. With New Year's Eve on the way it's still cookie season. Voted you up, UAI, and will share! Yes, and gave you a star too! These are great recipes that everyone should have. Maria thanks so much for stopping by always nice to see you. Hoping you and yours will also have a very Merry Christmas and a Happy New Year. Hugs. Yummy sounding and well-detailed recipes...thank you, Moonlake. I will look forward to trying a couple of these out, starting with those pecan puffs. Peggy W, Thank you I appreciate you stopping by and Merry Christmas to you. What a wonderful array of Christmas cookies...or homemade cookies for other times of the year as well. Your photos were also great. I liked how you decorated the Ritz cracker ones with the holly. Very festive! Up and useful. Thanks and Merry Christmas! Om Paramapoonya, Thank you and Russian teacakes are very easy to make. Thanks so much for stopping by. AliciaC, Always nice to see you thanks so much for stopping. I wish I could decorate the Ritz crackers a little better than I do. Lovely recipes and pictures! I never had Russian teacakes. They definitely sound like a must-try! This is a great collection of cookie recipes, moonlake! The cookies would be lovely Christmas treats. The Ritz crackers recipe sounds especially delicious. Jamie Brock, Your welcome glad you liked the hub. Thanks so much for stopping by and for your vote. Merry Christmas! oh wow.. thank you for all of the holiday cookie recipes. They all sound amazing! Voted up, useful.. thank you and Merry Christmas! tillsontitan, We have Cookie Monster living in this house so we always have lots of cookies and he's always looking over my shoulder making sure I'm doing it right. Plus he just has to get his hands in that cookie dough. After Christmas Cookie Monster has to buy store bought cookies because I know I won't eat them. Thanks so much for stopping by and for the votes. rutley, It sounds strange doesn't it. We have made these for many years so it is an old recipe. Thanks so much for stopping by. vespawoolf, I think you will like them. Thanks so much for stopping by and leaving a comment. Holy cookies Batman! 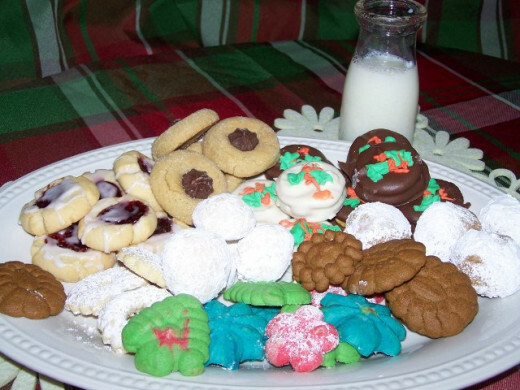 This hub has enough cookie recipes to make it through Christmas. You've done a beautiful job moonlake....great recipes, pictures, directions, this hub has it all...not to mention delicious. Those Ritz and peanut butter sound beyond delicious. mary615, Our family loves them and they really are easy to make. Thanks so much for stopping by. aviannovice, Thank you. They are a big part of our family's Christmas. Thank so much for stopping I appreciate it. Great Hub and pics to go with it! Never thought about Ritz as cookies. I'd love to try all these recipes, but I'm especially a fan of peanut butter. The Ritz crackers, pb and chocolate are irresistible.Can't wait to try them---thanks! Thelma Alberts, Thank you for stopping by always nice to see you. I appreciate your comment. It wouldn't be Christmas around my house till I start baking. I have bookmarked this Hub, cause chocolate covered Ritz cracker sound SO good. carol7777, Thanks so much for stopping by. I know when Christmas is over all cookies leave the house. I appreciate your comment and have a Happy Holiday. Bake Like a Pro, I have the same wish as you wouldn't that be great. Thanks so much for stopping by have a Merry Christmas. Horray! Cookies are one of the biggest parts of the holidays. Nice recipes and good work! Yummy! You make me feel hungry now. 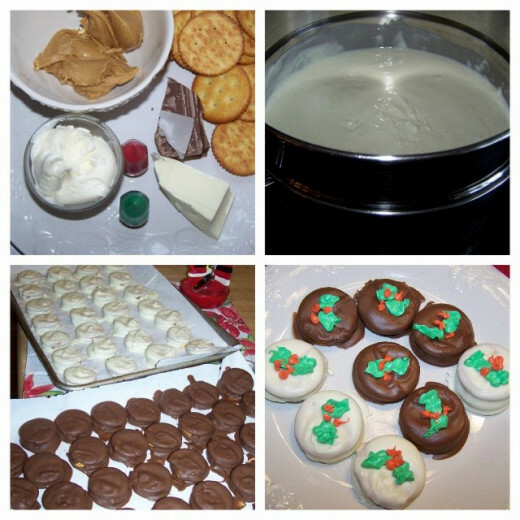 These recipes are great for this Christmas season. Thanks for sharing. I have to try some of these recipes. I wasn't hungry when I woke up but now I am. These all look so good...I hope you don't get fat looking at cookies. Great recipes.